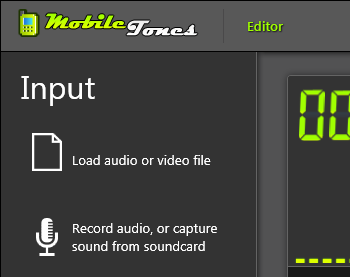 MobileTones is a free ringtone-maker, -recorder and -converter. 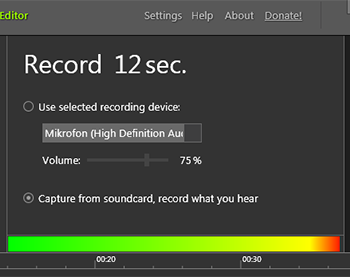 Create ringtones from your audio/video files, record something over a microphone or line-in, or use loopback recording to capture sound directly from your soundcard (also known as 'Stereo-Mix' or 'What you hear'). Click Load audio or video file to create a ringtone from an existing file, or click Record audio... if you want to record a ringtone. The codecs for ogg, flac and webm must be installed seperatly, they can be found at xiph.org (free available). 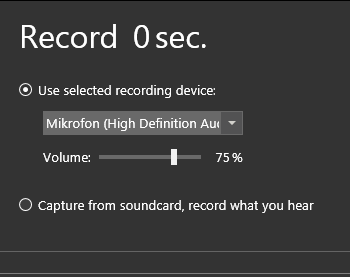 You can either record something over a connected recording device like a microphone, or you can directly capture the sound from your soundcard (record what your hear). You can use Capture from soundcard to create ringtones from DRM protected music, or to record audio from streaming platforms like youtube or soundcloud, free and legal. Just play it and hit the Record button. The maximum recording length is 60 seconds. While recording, the input level is displayed on the bottom of the recorder. Use the Volume slider to adjust recording level for devices. For soundcard capturing, use the source (e.g. your player) to adjust recording volume. After recording has finished, the recorded file is directly loaded into the timeline player for editing. 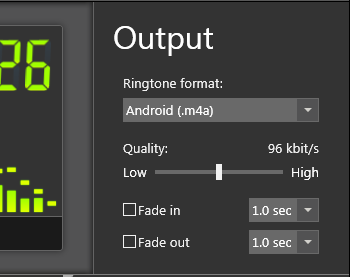 Select your ringtone format over the dropdown box, and set the desired quality (64, 96, or 128 kbit/s). If you want your ringtone to fade-in and fade-out, just hit the checkboxes and select time. You can use the timeline player to playback your audio file and to set begin- and end-position for your ringtone. Set begin- and end-position by selecting a region with your mouse, just keep left mouse-button pressed and draw the region on the timeline. Or use the Begin and End buttons to set positions. You can change the selected region also by dragging the markers on top of the timeline to a specific position. IMPORTANT: A ringtones length should be 30 seconds at maximum! Some phones can't handle ringtones with longer duration. Click Preview to playback the selected region. Click Save to create and save your final ringtone. 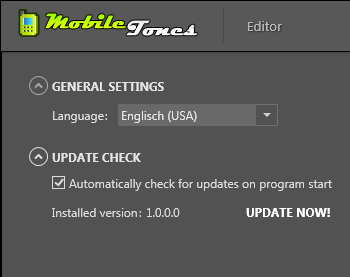 Click Settings in the header menu of MobileTones to change default language, or check for the latest updates. Place your new ringtone in the ringtones folder, alarm tones in the alarms folder, and notification sounds in the notifications folder. Open iTunes and drag 'n drop your new ringtone to the iTunes window. The file will be automatically added to the Ringtones category in iTunes. The ringtone can now be synchronized to your phone. The easiest way is to connect your SD card to your computer via microUSB as USB Mass Storage. Create a new folder 'Ringtones' (or use existing one) and copy your ringtones into that folder. The ringtones are now available from your SD card and can be chosen from the notification settings on your phone. Connect your phone to the PC via USB and open your device in explorer. Navigate to your phones directory, there should be a folder titled Ringtones, just copy your ringtones there. Now you can select your new ringtone on your device over 'ringtones+sounds' settings. The Microsoft .NET 4 Framework must be installed to run MobileTones. The software is based on Microsoft's newest multimedia technology Media Foundation, you can extend the input format support by installing third-party codecs. For example, you can add .ogg or .flac support by installing the respective codecs from xiph.org (free available). MobileTones uses parts of the WPF Sound Visualization Library for audio visualization. The WPFSVL library is open-source and released under the MIT license.